CM Magazine: Jake and the Giant Hand. (Weird Stories Gone Wrong). Jake and the Giant Hand. (Weird Stories Gone Wrong). 129 pp., trade pbk., Epub & PDF, $9.99 (pbk. ), $8.99 (Epub), $9.99 (PDF). ISBN 978-1-4597-2421-1 (pbk), ISBN 978-1-4597-2423-5 (Epub), ISBN 978-1-4597-2422-8 (PDF). Grades 5-6 / Ages 10-11. Jake looked closer. Gus was eating something. It looked like a ... fly? But no fly could be that big. It was the size of a bat. And it was buzzing. Gus chomped whatever it was in half then ate it in two gulps. Gone. Then he looked up at Jake in the window and wagged his tail. He licked his paws with the tongue-of-death. Jake yelled out the window at the old dog. "That's disgusting! Your name is in the word disgusting, did you know that? Dis-GUS-ting. That's what you are!" Jake has been looking forward to his annual summer visit to his grandfather's farm, but when he gets there, things seem a little strange. There are giant flies all over the farm and nowhere else. Jake's grandfather is edgy and won't discuss some topics, including the giant flies. The local librarian is hiding news articles from Jake. Then there is the strange white rock that looks like bone at the bottom of the post hole Jake and his grandfather dug. Jake's friends have been telling him a local tall tale about a giant's hand that was found and buried on a local farm, and Jake begins to wonder if the story is true and if the hand is buried on his grandfather's farm. Jake and the Giant Hand is the first book in Philippa Dowding's new series, "Weird Stories Gone Wrong". This book starts off with an interesting concept, that one person's truth is another person's lie, so that some tall tales may be true or partly true. This theme is woven through the book by the two supposed tall tales that Jake's friends tell him. The first story (told to Jake the previous year) is about an elderly lady who disappeared into a nearby swamp and became a swamp monster haunting the area. The second story is the one about the giant hand buried on a local farm. Partway through Jake and the Giant Hand, Jake finds out that there is some truth to the first story as a local elderly lady did go missing in the swamp back in 1908. Dowding helps blur fact and fiction more with specific details in the local tale about the giant hand, including a wedding ring on the hand with an inscription. Details like the ring help make the local tale much more truthful but also much more outrageous. Even the epilogue leaves the truth of the story open to interpretation, which makes the story much more compelling. Jake and the Giant Hand is a good book for reluctant readers. It is an easy read, with simple language and a similar presentation to a fireside ghost story. This is a fast-paced book, with the events taking place in just a few days. The pace will keep readers interested in the story and keeps the plot simple, but it does minimize any character development. The way the plot jumps from event to event may also leave some readers feeling like the story is incomplete, which is exacerbated by the rather abrupt ending. The epilogue does provide a short wrap-up to the events in the main story. The stories in the "Weird Tales Gone Wrong" series are meant to be a mix of tall tale and ghost story so readers should not expect a horror story. Still, Jake and the Giant Hand is somewhat creepy, and the giant flies are wonderfully gross. How creepy readers find the story will depend on the individual reader. 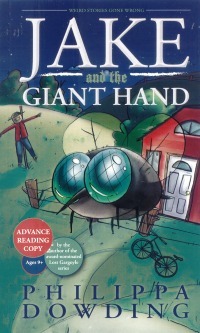 Jake and the Giant Hand is a interesting book for reluctant readers, younger boys and readers interested in tall tales.